Extensive overloading of trucks on the N2 restricted by dedicated staff who weigh and check trucks for road-worthiness. Damage to roads because of overloading leads to higher maintenance and repair costs and shortens the life of a road. 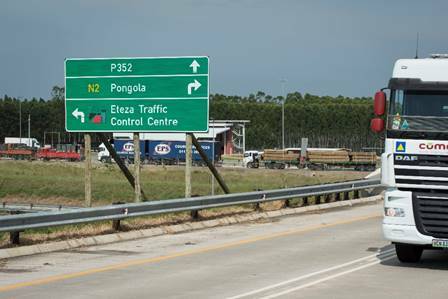 The Eteza Traffic Control Centre on the N2 in northern KwaZulu-Natal is helping curb the overloading of trucks that has resulted in a marked deterioration in the condition of the province’s road network. This in turn places an additional burden on the state as well as law abiding road users who ultimately carry the costs of careless and inconsiderate overloading. “Weighing the trucks helps the community at large by taking over-loaded trucks off the roads as they often are the cause of accidents. That is how we are trying to limit the problem that we are faced with,” said Ndebele. David Makhoba, manager of the traffic control centre, which employs 23 people, said apart from weighing trucks, the roadworthiness of vehicle was also checked. “The common offences are speeding, drunken driving, operating unroadworthy and unlicensed motor vehicles.